Don't miss an issue and save up to 72% off the newsstand cover price! 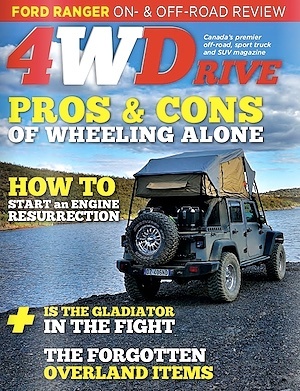 There are 8 issues every year packed full of all the 4x4, off-road, race, club, trail, and overland stories you can handle, plus tech installs, tools, tips, tricks, guides and reviews on 4x4 trucks, SUV's and their accessories. Only available in Canada and the continental USA. Please allow 3 to 8 weeks for your first copy. You can get a digital subscription for your PC, Mac, iPad, iPhone, iPod and Android tablets right here! You'll receive an email within two business days (or less) after your payment is processed, providing you with access to your first issue. 8 issues every year - same price everywhere in the world. Our monthly newsletter is chock full of discounts, and contests along with 4x4 articles to keep you up-to-date, informed and entertained.